Traditional drug delivery methods such as powders, capsules, intravenous needles, liquids, and pills are often ineffective and might lead to side effects which are undesirable. Transdermal delivery comprises an effective and important route for delivery of new drug. These patches can be placed anywhere on the human body and it can be worn for as less as 7 hours to as long as one week, thereby depending on its therapeutic indication. The adhesive patches which are medicated ones are designed in such a way that they get themselves attached comfortably to the skin’s surface, which helps the patients use the patches for a longer period of time. Transparency Market Research (TMR) has made an observation that the condition of the vendor landscape of the said market in the Saudi Arabia transdermal skin patches is considered between moderate to high. A handful of market players have a strong presence in the market in general owing to a high-level of expertise. The leading market participants such as Teva Pharmaceutical Industries Ltd., Novartis AG, and Johnson & Johnson account for a collective share of around 22% of the overall market in the year 2016. This has substantially intensified the level of competition. According to the report published by TMR, the Saudi Arabia transdermal skin patches market is forecasted to be worth around US$ 67.41 mn by the year 2025 from an earlier valuation of around US$ 44.96 mn in the year 2016. During the years of forecast that extends from the year 2017 to the year 2025, the world market is anticipated to rise at a growth rate of 4.7% CAGR. The products that are available in the Saudi Arabia transdermal skin patches are drug in vapor matrix, reservoir, matrix, and adhesive. 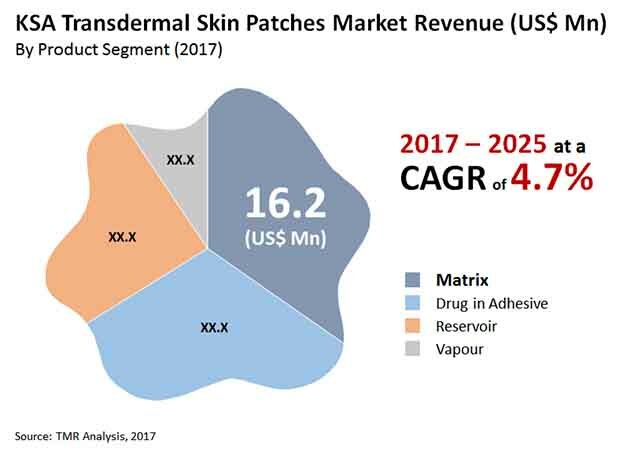 Of all of these, the segment of matrix accounted for a dominant share in the market for transdermal skin patches and is anticipated to account for a market share of around 35.1% across the globe taking revenue in consideration by the end of 2025. Such a rise is attributed to the shifting of preference for matrix systems so as to make patches for volatile molecules under settings of controlled release. The phenomenal progress of this sector is attributed to the non-antagonistic and non-toxic characteristics of polymer matrix options that are known to diffuse drug with controlled precision. Increasing awareness about disorders and diseases and the soaring expenditure on healthcare have bolstered the sales of transdermal skin patches across Saudi Arabia. The use of transdermal skin patches also diminishes the need for injections, thereby diminishing the cross contamination and infections risk. Whilst in case of various adverse effect to the medication, these skin patches can be removed quickly as well. The increasing accessibility to convenient healthcare and expansion of geriatric population has further bolstered the demand for transdermal skin patches in the recent years. Surging investments in research and development of transdermal skin patches result in positive influence on the overall revenue of the said market. The rising trend of self-administration of medications at home is further prognosticated to boost the intake of these skin patches in the years to come.